Kultá Kitchen & Bar, opening in January, will bring the most interesting Lappish ingredients and modern flavours to Helsinki. Amongst other delicacies, the menu will offer Arctic char, ptarmigan, whitefish and spruce sprout, as well as reindeer. The restaurant will be located in Lapland Hotels Bulevardi, in the heart of Helsinki. Kultá will also have a bar serving genuine and fresh northern flavours, as well as a banquet floor, “Rikastamo”. When the hotel is opened for business, these elements will bring a piece of the northern experience to the urban environment. “We want to introduce a modern version of the Lappish spirit to Helsinki and offer something that has never been seen here before. Lapland and its nature are at the core of everything we do. We put great attention to the atmosphere and its tranquillity. We focus on exquisite service,” says Riikka Tenhunen, Restaurant Manager at Kultá and Rikastamo. Lappish food fits current culinary trends, with key emphasis on where ingredients are sourced. Based on genuine flavours, the cuisine relies heavily on the world’s purest ingredients. At the heart of the kitchen, a charcoal grill brings out the best flavours. “Pure food is really the buzz right now. Lappish ingredients are a natural response to this trend. We Laplanders eat what we see outside our window. It is fantastic to serve our guests food that we know exactly where it came from,” says Tero Mäntykangas, Executive Chef at Lapland Hotels. The Kultá menu will feature quintessential Lappish ingredients, like ptarmigan, king crab and Arctic char. It also includes an ingredient that is especially popular amongst Japanese guests: pine mushrooms. “With regard to ingredients, we are as self-sufficient as possible. I know where our reindeer are herded, who supplies our ptarmigans, and the precise origin of our swidden turnips from Sodankylä. Our major season for harvesting ingredients is from August to October. We need to be on the lookout when getting them: for example, we need to carefully plan next year’s requirement of Arctic cloudberries to secure Lappish berries for breakfast. An interior with dark tones and a hint of gold provides the restaurant with a tranquil northern atmosphere. Anu Pentik has designed tableware especially for the restaurant. A fourteen-metre golden bar forms an integral part of the space. “The bar is definitely an important part of our restaurant. It will serve customers until late evening. The bar is unique, not only because of its impressive appearance, but also because of its drinks menu. There are not many places in Helsinki that garnish the edge of your glass with lichen,” Tenhunen boasts. During summer, two terraces will expand the restaurant’s space. Lapland Hotels Bulevardi’s banquet floor is available for events and conferences. “Our pure flavours and our carefully designed atmosphere create an unforgettable experience. The Rikastamo banquet floor will enable customers to enjoy special occasions surrounded by a breath of northern mystique,” Tenhunen says. Early this summer, Mäntykangas and his team demonstrated their know-how at the Taste of Helsinki event. Lappish cuisine and unique flavours gathered a lot of attention at the event. Many visitors were able to try rare ingredients for the first time. “At the Taste of Helsinki event, we showcased many of the elements we will provide to Kultá’s guests. For instance, spruce sprout pasta, cep fudge and Arctic char. Few people know the taste of, lets say, Arctic char from before. 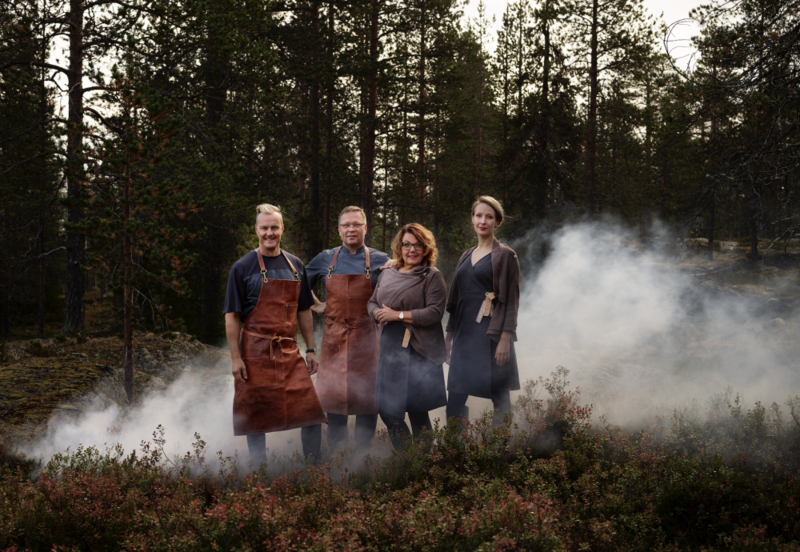 Modern Lappish cuisine was warmly received at the event,” Mäntykangas says.